This volume brings together fourteen essays by Israeli, European and American scholars honouring the distinct contribution of Yairah Amit to the literary study of the Hebrew Bible and to her public role, fostering especially the place of the Hebrew Bible in Israeli education. In biblical studies she has made significant contributions to the study of redactional and editorial activity, which she has always viewed from a rhetorical and literary point of view. These aspects were uniquely developed in her work on the books of Judges and Chronicles, in which literary considerations always lead to the recognition of the ideology behind the redactor’s work. Another key theme of hers has been overt and hidden polemics expressed or suggested by the narrative text. 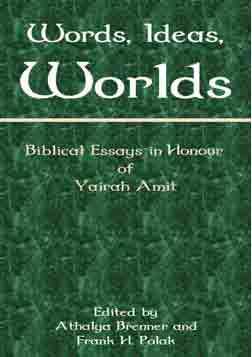 The studies assembled in the present volume deal with the many aspects of Amit’s work, from the biblical and post-biblical down to the mediaeval and the modern period. Central fields are the art of the redactor and inner-biblical polemics (Diana Edelman, Cynthia Edenburg, Nadav Na’aman, Meira Polliack, Dalit Rom-Shiloni), literary scrutiny (Ed Greenstein, Lillian Klein Abensohn, Frank Polak), ideology in social and religious contexts (Ehud Ben Zvi, Israel Knohl), and feminist and cultural studies in a wider sense (Athalya Brenner, Cheryl Exum, Yael Feldman, Shulamit Valler). This is the fifth volume of the Amsterdam Studies in the Bible and Religion (ed. Athalya Brenner), a sub-series of the Bible in the Modern World and Hebrew Bible Monographs. Athalya Brenner is Professor Emerita of Hebrew Bible/Old Testament at the University of Amsterdam, The Netherlands, and Professor of Biblical Studies at Tel Aviv University, Israel. Frank H. Polak is Professor of Bible at Tel Aviv University, Israel. 4. Diana Edelman, Hidden Ancestral Polemics in the Book of Genesis?